By US Coast Guard laws, the Fearless pirate ship can hold a maximum of 49 passengers, regardless of age or size. Can we buy tickets day-of at the ship? We recommend buying tickets in advance as most cruises sell out. We can not sell more than 49 tickets for any cruise so buy your tickets early to ensure you can come aboard. Check availability online. The Fearless sails Rain or Shine (we will sail in rain.) Please plan to dress according to the weather including rain jackets, ponchos, and umbrellas. If the Captain deems the weather unsafe to sail (ie thunder, lightning, high winds) and a cruise must be canceled passengers will be notified by phone prior to the cruise and rain checks will be issued. If a cruise is interrupted by unsafe weather conditions and the boat must return to the dock rain checks will be issued depending on the length of your sailing. Is there a bathroom or food/drink on board? There is a head on board the pirate ship (bathrooms for you landlubbers) which is large enough for a parent and their child. We do not sell food or drinks aboard the ship, but passengers may bring drinks and snacks aboard. Yes, strollers are allowed on board, but collapsible umbrella models are recommended. Yes, the Urban Pirates ship Fearless is handicap accessible for wheelchairs of all sizes. Are there seats on the boat? Yes, there is some seating available at the back of the ship and around each of the masts, although we encourage everyone to get up and take part in the pirate activities. Landlubbers will walk the plank! Will we get wet on the ship? No, the water cannons on the ship only point off the boat, although there may be some spray from the wind. Is there a parking lot for the ship? No, but there are many metered parking spots parking garages located around Fells Point. Parking Instructions. Do passengers have to wear life jackets? No. There are life jackets for every passenger aboard the pirate ship but the Coast Guard has deemed it safe to not wear life jackets during the normal Urban Pirates cruise. If there is an emergency our highly trained staff will lead passengers to wear life jackets to ensure their safety and well being if necessary. Possibly, its a smooth sail unless we hit a wake from another boat. How many bookings do we need for the cruise to go out? We need a minimum of 15 people to book a cruise in order for us to sail. We reserve the right to reschedule your cruise if under 15 tickets are sold for any cruise. What takes place on your Family Adventure Cruises? Each Family Adventure Cruise includes a 'Check-in time', roughly 30 minutes for dress-up, tattoos, and drawn-on facial hair before the pirate ship departs. Once out on the water the crew will teach guests how to talk, sing, dance, play games, and blast water cannons as part of the interactive pirate story. At the end of our adventures everyone always receives their choice of treasure. How long are your Family Adventure Cruises? Each of our cruises includes 30 minutes of check-in and boarding activities and a full hour out on the water, making the experience an hour and a half long. What is ‘dress-up’ on the boat? We dress our pirates (both young and old) aboard the ship. We have a costume chest which provides colorful pirate vests and waist sashes for all riders. All riders will be offered a pirate tattoo and drawn-on facial hair to complete your pirate look. You are welcome to wear your own pirate outfit before you climb aboard, the crew will dress up riders of all sizes. We encourage everyone to get dressed up! When does the ship leave the dock? The pirate ship will depart promptly 30 minutes after check-in time. Passengers who have not checked-in 10 minutes prior to cruise departure will forfeit their reservations. No refunds or rescheduling will be issued for passengers who miss departure. What age range is the Family Adventure Cruises meant for? The Family Adventure Cruise program is designed for families with children 2-12 years old. But, everyone, regardless of age, will be encouraged to participate in the program and join in the fun. How long are your Adult ‘B.Y.O.G.’ Cruises? Each of our cruises includes approximately 30 minutes of check-in and boarding activities and spends a full hour out on the water, making the experience an hour and a half long. What kind of drinks are we allowed to bring? Any adult beverages and mixers in cans, glass, or plastic containers are allowed (cans are recommended). You are welcome to bring coolers. There are no drinks, ice, or mixers sold on the ship. You may drop off coolers to our dock location before your trip if you'd like. All of our guests aboard the ship are offered a colorful pirate vests from our costume chest, a pirate name, and a pirate tattoo to complete your pirate look. You are welcome to wear your own pirate outfit from home. We encourage everyone to get dressed up! No, the pirate ship does not allow smoking on board the ship. The pirate ship will depart promptly 30 minutes after check-in time. Passengers who have not checked-in 10 minutes prior to cruise departure will forfeit their reservations. No refunds or rescheduling will be issued for passengers who miss departure. Check-in on time to ensure you won't miss the boat. Do you have to be 21+ to ride an Adult 'B.Y.O.G.' Cruise? Yes, you must be 21+ years old with a valid government ID to ride an Adult cruise. Please have ID ready at check-in. No under age passengers will be allowed on the ship. Do we need to buy tickets for adults and children? Yes, you must reserve a ticket for every passenger in your group, including all adults and small children/infants. The Coast Guard will only allow us to carry a maximum of 49 passengers and we must include every person in that count. Most cruises sell out so purchase all tickets for your party in advance. Do we need to buy a 'Birthday Package' to celebrate a birthday? Yes, unless you buy the 'Full Boat Package' for up to 49 passengers you will be sharing your adventure with other ticket holders – Never fear, we have plenty of space for activities for everyone. Are we allowed to bring cake/cupcakes? Due to the structure of the activities on the ship there is not time or space to serve cake during the cruise. We ask that you do not bring cake or cupcakes on the ship. Are we allowed to bring goody bags/party favors? Yes, you are welcome to pass out goody bags or party favors to your guests. We ask that goody bags are given out only as your guests are leaving the ship so that they may play with their contents off of the ship. You can also purchase additional party favors from our kiosk for $5 or less each. Should we bring decorations? Balloons? Piñatas? No, the pirate ship is decorated with paintings and flags which add plenty of pirate flair. We ask that you do not piñatas as there is not enough space or time to play with them. Do you have birthday invitations available? Yes, we have free customizable E-vite at the bottom of our 'Birthday Adventures' page. Can we rent the boat for a private party? For more than an hour? 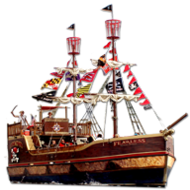 Yes, the pirate ship can be chartered for up to three hours at a time. For charters departing before 5pm the cost is $800 for the first hour on the water, and $750 for each additional hour before 5pm. For charters departing after 5pm the cost is $1000 for the first hour, and $950 for each additional hour after 5pm. Can we bring food and drinks on a private charter? Yes, on all full boat charters our policy is B.Y.O.G. – Bring Your Own Grog! Stock your cooler with what ever grog will quench your thirst and bring along any grub you would like to eat. 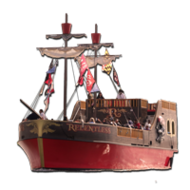 We will work with the catering company of your choice to throw the ultimate pirate private party.